Do you often misplace your key or blank on a name now and then? Don't worry - this doesn't mean your mind is doomed to turn into a colander as you get older! Just like you do exercise to build up your muscles, you can adopt habits to muscle up your brain. 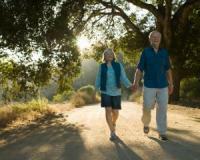 Here are four top tips for keeping your brain young and your memory sharp at any age. When you exercise, your muscles burn glucose for fuel. In turn, this stabilises your blood sugar levels, which is important for brain health. Just 30 minutes of walking every day is enough to do the trick. Another way to keep your blood sugar on an even keel is to eat four to six small meals a day. A Rush University study found that people who ate about three servings of vegetables daily ha a 40% slower rate of cognitive decline over six years than those who shunned vegetables. This left the veggie lovers with the mental equals of someone five years younger! Leafy greens seemed to have the strongest effect, potentially due to their high content of vitamin E – a key vitamin for brain health. A study published in the journal Neurology found that in memory tests, people with a healthy BMI of 20 recalled an average of nine out of 16 words, while those with a BMI of 30 – the threshold for obesity – only remembered seven. While the difference may seem small, the researchers say it can be enough to have a significant impact. Norwegian research has found that older people who eat any type of fish at least once a week do considerably better on mental tests than those who skip fish. It’s still unclear whether it’s omega-3 fatty acids or another component that gives fish its brain-boosting benefits, according to the researchers. Maintaining brain function into old age is as easy as that!